At Pure Water Plumbing, located in Grants Pass, Oregon, we offer a unique water purification water cooler that is perfect for use in any business office. Employee wellness is an important issue for companies both large and small. By enhancing employee health, both the individual and the employer yield many benefits. The results are often physically and emotionally healthier employees, which can help control the cost of health care benefits and create higher office morale, eventually improving a company's long-term success. • You'll also be rid of the hassles of storing refills and empties. 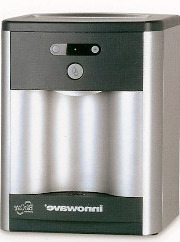 With an Innowave system, you won't have to worry about water deliveries for your office. Innowave's goal is to provide water treatment systems that meet the highest standards and provide the safest drinking water. Innowave systems always produce water that exceeds EPA standards. Installing an Innowave point-of-use water treatment system can virtually eliminate the risk of worker's compensation claims due to injury caused by lifting heavy bottles. Innowave incorporates the most modern water technologies into its line of water treatment systems. By utilizing a combination of water treatment technologies, Innowave water treatment systems consistently provide high quality drinking water. According to the American Journal of Public Health, 35% of all gastrointestinal illness is water-related and preventable. In many instances, the cost of one person being absent for one day due to gastrointestinal illness can be as high as $500. Eliminating just one sick day by providing higher quality drinking water can help you to realize a return on your investment. A national survey among 500 human resource managers indicates that there is clearly a desire for treated drinking water among employees. Two-thirds responded that their tap water quality was bad or fair. Nearly 60% believe the water they drink can affect their health. Letting us install a water-treatment system for your business will benefit your employees and your business. Contact us for more information regarding our state-of-the-art water filtration system. The best way to know just how good drinking water from an Innowave system can be is to experience it for yourself. Your office may be eligible for a free one-week trial. You will immediately taste the quality difference of water from Innowave® office water coolers and your trial is completely risk free! Your local authorized Innowave dealer will supply you with everything you need to know about the Innowave system that is just right for your workplace!